Is this update a session of Dungeons and Dragons or the side of some guy’s van from the 1970s? You make the call! 1989 was filled with a ton of “hack ‘n slash” games, including Golden Axe, the arcade hit that found the sweet spot between earlier H&S platformers and the combat trappings and tall play-fields of post-Double Dragon beat-em-ups. This update has pixel art tributes to those games. Mini-logos – It’s finally been redesigned so you’re not forced to wait until a zillion mini-logos load up. It starts with a text list of the different sections and you click on the one you want to see, including the old “all at once” view. Graphic Generators – All of the new content was added to the fighting game-scale generators. Mega Ran’s current Kickstarter will be winding down Friday night, so kick in some scratch if you like what he does and have the dough to do so! December will be the wrap-up for the whole “the Revenge of 1989” 25th anniversary shindig. 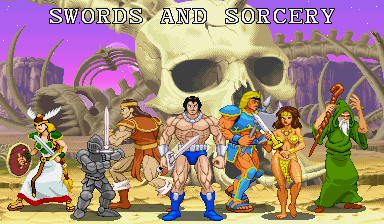 I’ll try to wrap up various loose ends, including sprites to complete certain teams (I’m one character away from the Dracula’s Curse heroes team and Belger still needs a wheelchair) and a few other issues. Take care and I’ll see you again next month!